Welcome spring or summer with this bountiful vegetable soup, chockful of the season's most prized veggies and fresh flavors. What's amazing is that--prep work aside--this soup is ready in about 15 minutes. 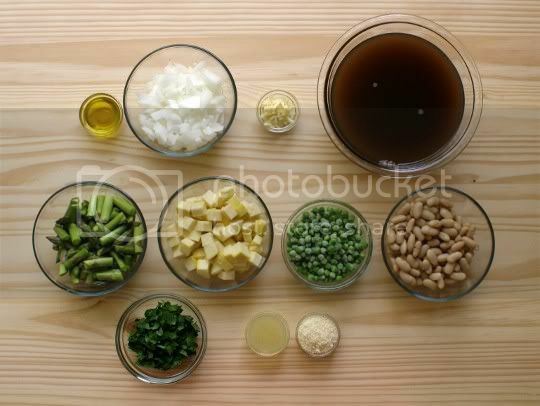 Onions and garlic are sauteed in olive oil; next, mushroom stock, asparagus, and summer squash are added and cooked until hot. Peas and cannelini beans are added next, and the soup is cooked until heated through. Be careful NOT to bring this to a boil: you want the veggies to keep their texture and be cooked just enough to be tender yet firm. Finally, stir in chopped Italian parsley, lemon juice, and Parmesan cheese, if desired. Season to taste with salt and pepper, and you're done! What I find interesting about this soup is the contrasting combination of flavors. You've got all these warm weather seasonal veggies cooked in an earthy, rich, almost perfect-for-cold-weather mushroom stock; earthy and salty Parmesan just intensifies that flavor. 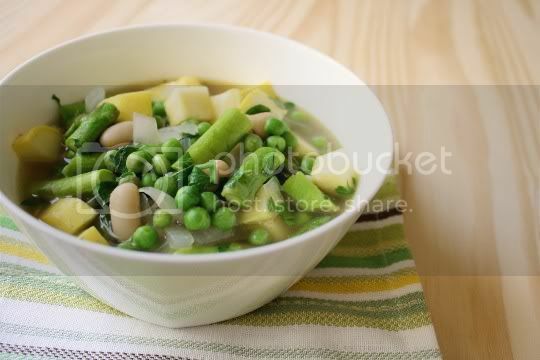 But the longer this soup sits, the sweeter it becomes, as the sweetness from the veggies (peas especially) seems to seep out...yet the added lemon juice allows just enough tanginess. Although the recipe suggests four servings, I'd say this is more like six. The servings are hearty, especially because of the firm veggie textures. Still, serve a nice hunk of crusty bread alongside this for a complete meal. Make again? Yes. Hearty and filling, light and flavorful! 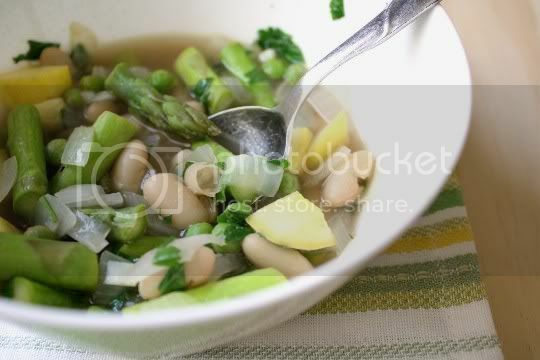 I am vegetarian so I am glad I found your site, this recipe of spring vegetable soup is perfect as I am craving perfect soup with crusty bread. I love asparagus! I wish it was in season all year round. I made Asparagus Roll-Ups for a snack over the weekend! Delicious! I'm going to have to try your recipe next!